Yakon is a perennial plant native to the Andes, Columbia, Peru and Equador. It has large felty leaves that look rather tropical, so it looks good in a garden just for it s handsome leaves alone. This tuber has a thin brown skin which when peeled away, reveals a crisp golden flesh. It tastes like a crunchy sweet pear. Although it’s sweet, its starch is stored in the form of inulin. Inulin is not absorbed through the human gut and even though the plant is sweet, according to the Australia New Zealand Food Authority, it does not affect blood glucose levels. As it is not absorbed, they term it a soluble fibre rather than a starch. It’s considered a good food for diabetics as it doesn’t alter blood sugar. It’s sweet yet can be used for savoury dishes and may be eaten peeled and cooked or raw. It can also be juiced then boiled and reduced til it becomes syrupy , making a sugar free sweetener. 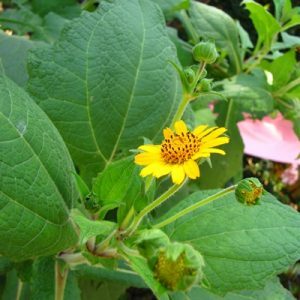 Our Yakon grows to about 1.5 metres with small heads of lovely golden yellow sunflowers in late summer as the days shortened. Our stingless bees and hoverflies buzz all over those flowers, working hard. Watch them grow to 1.5 metres over spring and summer. Keep moist. They will flower in late summer producing flower heads of mini sunflowers. In autumn the plant dies down. 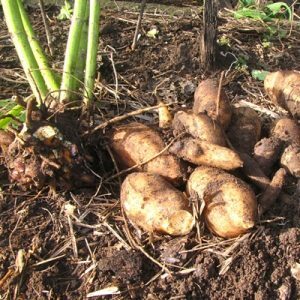 This is when you can begin harvesting the tubers that look a bit like dahlia or sweet potato tubers. Expect to harvest between 1 and 10 kilos of tubers per plant. 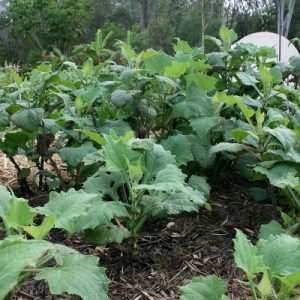 You’ll find each plant has small red nodes at the base of the stem and above the tubers. These are the setts which are the parts you plant for a new crop. You don’t eat this part. Replant the pink sets within a month or two of harvest. I’m replanting this year in July into fertile soft soil in full sun.